Second, we needed to confirm that our advice to flush 5 minutes was helpful in reducing water lead risks. Third, we wanted to get information about whether the lead in water was soluble or particulate, because small particles are not removed by low cost Brita pitcher filters with 90% plus effectiveness. Finally, we wanted to test the effectiveness of some low cost Brita pitcher filters directly. Low cost Brita pitcher filters used to be certified for lead removal, before we showed that some tiny lead particles could go through them. We did confirm high lead. In 3 of 3 homes that we resampled where the plumbing was working normally, each tested with lead levels above 15 ppb (even when we collected and controlled the samples every step of the process). One home tested above 150 ppb. In the fourth home, the plumbing was blocked so badly the water would only come out at a trickle, and the lead levels were only 3 ppb. We intend to resample this home again when the water is flowing at normal flow rates. An interesting and logical hypothesis based on this result, is that sampling (or collecting water) at a low flow rate, might reduce the lead in water. This would only be true if a lot of the lead in water is particulate (see below). Figure 1: We turned on the tap after the water sat for at least 6 hours, and then filled 1-liter bottles in sequence 1-8. At this house, every bottle (1-8) was over the 15 ppb action level and the 10 ppb WHO standard (red line). We then collected two bottles after 5 minutes and 10 minutes of total flushing respectively. Five minutes flushing was needed to get below WHO standards at this house, whereas 10 minutes flushing was slightly better. 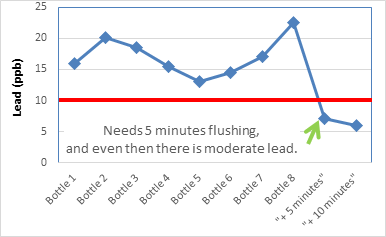 Secondly, we did confirm that 5 minutes of flushing worked okay for reducing lead risks (see Figure 1). In every case tested so far, our advice to flush a minimum of 5 minutes did get the lead below World Health Organization (WHO) recommended maximum values for lead in water (10 ppb). The data also showed that 1 or 2 or even 3 minutes flushing was not good enough. While we only have data from 3 homes, it is somewhat reassuring that 5 minutes helps dramatically, even though the lead levels were still above 5 ppb, which we still think is too high for infants using formula or pregnant women. So overall we are sticking with our earlier advice, although we will keep you posted on what we find. Third, for bottles 1, 3, 5, and 7 at each house, we passed some of the water through 0.45 um filters (i.e. filters with openings 0.45 micrometer in size). Tiny particles of lead would be removed by the filter, but soluble lead (i.e. lead dissolved in water like sugar and salt dissolve in water) should pass through. To our surprise, at most, only 15% of the lead went through the filter. This indicates that most of the lead in the water is particulate, which is what we found at Ms. Walters home as well. This also might explain why the fourth house in which water flowing at a trickle had low lead. Flow rate only has small impacts on soluble lead, and sampling at low flow should make soluble lead lower. But higher flow rates tend to increase release of particulate lead. So, the expectation based on our prior work is that while low cost Brita pitcher filters would help reduce the lead in water risk, they would not be 90% effective. We confirmed this for two Brita pitcher filters that we sampled. On average, they were only removing 40-60% of the lead. That helps, but it is not good enough for us. Please note that other Brita NSF certified devices should be working fine, but Brita pitcher filters are not NSF certified. A Flint resident smiles for the camera alongside bottles that we used to sample at her home. She agreed to pose when she heard accusations like ‘Perhaps Flint residents are putting lead in their water” that we have come across.